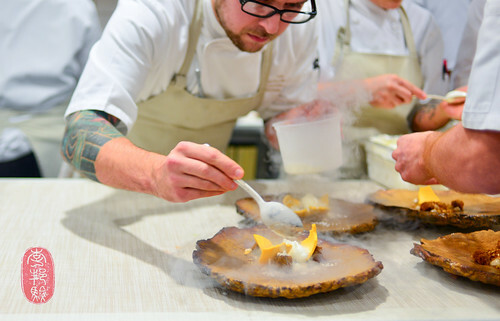 On the eighth of the Twelve Days of Christmas at The Restaurant at Meadowood, Christopher Kostow gave to me James Syhabout, chef of the one Michelin-starred restaurant commis in Oakland, California. At a question-and-answer session at the Culinary Institute of America, Syhabout told students about his upbringing as a child of two refugee immigrants. His mother, who is Thai, owned a Thai restaurant in Oakland where Syhabout says he first started working in the restaurant industry (the space is where Syhabout’s casual restaurant, Hawker Fare, is located now). Since then, he has worked in some of the best kitchens in the world. After working at Betelnut in San Francisco, and David Kinch’s Manresa in Los Gatos, he took some time to travel through Europe, working his way through the kitchens of elBulli, The Fat Duck, and Mugaritz. He returned to his home in the East Bay and opened commis, a small, 26-seater, in 2009. A few nights ago, Kostow and Syhabout cooked an eight-course dinner paired with wines from Grace Family Vineyards. Despite his upbringing by Asian immigrants (his father is ethnically Chinese), Syhabout’s food at commis isn’t Asian. “That’s what Hawker Fare is for,” he says. At Hawker Fare, he serves the food of Southeast Asia that he grew up eating. At commis, the food is a little bit of everything, drawing up on his experiences and travels as a chef. This is the type food that he presented at his Twelve Days of Christmas dinner (although, for family meal, he made the staff at the Restaurant at Meadowood Thai “chicken and rice”). My two favorite dishes from Syhabout’s side of the menu included a velvety oyster mushroom soup poured around a small gathering of puffed grains, a wonderful contrast of creamy and crunchy textures. I also loved his aged duck, served with a sweet sauce heavily infused with winter spices. The flavor of the duck was concentrated and strong. I loved it. Kostow presented a beautifully cooked slice of lamb shoulder, served with lamb marrow, chanterelles, and lovage. That was a comforting and delicious plate of food. For dessert, Daniel Ryan, the pastry chef at the Restaurant at Meadowood, reprised the sudachi cream dessert he served a few nights prior. But this time, he layered the sudachi curd and shiso granité with yuzu and finger limes instead of citruses. Ryan ended the night with pumpkin cake, frozen shards of pumpkin cream, and tangy buttermilk ice cream, all of which were showered with frozen white chocolate dust. You’ll find the entire menu from last night’s Twelve Days of Christmas dinner with James Syhabout, and a slideshow of the dinner below. With seaweed, warm soup of oyster mushroom. Sprouting legumes in a bouillon made with its liver. Grilled on the bone, with dates and spiced sugar. Lamb marrow, lovage, foraged greens. Yuzu confiture, finger limes, shiso granité. ~ by ulterior epicure on December 20, 2012. Thank you so much for sharing the fabulous menus so far! The details are interesting without being overdone and the photos are wonderful. What a fantastic experience this must be!